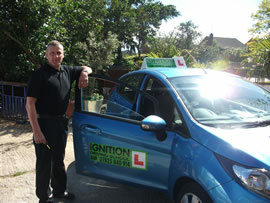 Ignition Driving School has a local, Gloucester driving instructor available to teach you how to drive. To get you started, the first driving lesson is FREE for beginners! * This driving lesson will help you understand the controls of the car and get you on the right road to success. Driving lessons in Gloucester are not only good value for money, with our block booking discounts and competitive pricing, but equally rewarding too with our loyalty card scheme! For every friend you refer to Ignition Driving School you will receive a high street voucher, earning you up to £105! So now you can spoil yourself whilst learning to drive! Mark is local to Gloucester and teaches in a modern, pupil friendly car. For your safety the tuition car is fitted with dual controls and for your comfort there's air conditioning. Mark also works weekends and in the evenings at no extra cost so you should be able to fit in driving lessons around your other commitments quite easily. Ignition Driving Schools instructors only teach pupils on a one-to-one basis, so you won't be picking up the next pupil on your driving lesson time, and all personal errands are done on our own personal time. On my first driving lesson I was really nervous and didn't really know what to expect. His learning style completely fitted to how I prefer to learn which helped me a lot and meant I learnt things easily without problems. Mark was able to completely boost my confidence as I knew he believed in me and knew I was capable of succeeding at any driving manoeuvre I was faced with. On my first test, I failed miserably and because of that it really knocked my confidence and patience with driving. Mark was able to identify that and did everything he could in order to make sure I passed the second time and became more motivated to pass. Mark is a brilliant instructor and I would recommend him to anyone. I had a really good experience with him.